Today the doors arrived and were installed they do look nice. Also the bathroom door was installed and it looks nice too. A little work was done on the bathroom tile now the tile man is working on the shower floor. Also the last load of gravel was delivered and I got the bill for the four dump truck loads of dirt and three dump truck loads of gravel. I don’t know if I got a good price or not the gravel is brought down from Mexicali 150 miles away so it isn’t cheap and the bill included the labor for spreading the gravel a man working all day with a shovel and wheel barrow for three or four days to spread the dirt compact it down and then spreading the gravel by hand as well. The bill was about $660. I also got the price for the new toilet and all the stuff inside it for $120 that’s about the same or a little less than in the states. Tomorrow the tile man should be back working on the bathroom and hopefully the floor will be done completely tomorrow, but I’m not holding my breath. I sure would like to use my new shower. I’m having a little bit of buyer’s remorse as I see the money going out faster and faster. I know I am almost at the end of this building stuff and soon I will be able to move into my new house, but still I wonder if I should have spent all that money. I guess you can’t have your cake and eat it too. Here are some photos of the new exterior doors, I think they look nice the trim around the doors still has to be painted but that will only take an hour or so. I have been in Mexico since Thanksgiving (U.S.) which makes this my sixth month here. So far the longest time I have spent in Mexico. The Casa (house ) is still being built that has been an ongoing project since January. There are still things that have to be done to make the house livable; the men are working on laying the tile in the bathroom and the gas line is being put in today (maybe). The cabinets guys have been here and measured for both the kitchen and bathroom cabinets. Red dirt has been delivered and spread over the patio area and now gravel has been delivered and it is being spread over the patio area. The reason for the both red dirt and gravel is so the gravel has a base to settle into other wise it would sink into the sand. I have planted 14 oleander plants to form a green screen to the east and block the view of some older trailers and give some privacy. I also planted four bougainvillea plants against the house and I hope they take in this sandy salty soil. 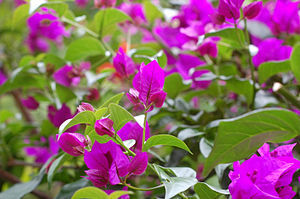 I mixed in potting soil and a little red dirt so maybe that will be enough to give the bougainvilleas a chance to grow. This is all the stuff that takes time, lots of time to do and these guys are in no rush to get things done. I am told that things are moving very fast that normally a house takes six months to year to build. So I putz around doing gardening things when I can, shopping for food, taking spanish lessons twice a week and once in while like yesterday I had a pedicure. I scour the local desert for decorative rocks to outline the flower beds and in general stay out of the way. The men don’t like it if I do stuff so I have been regulated to cheerleader. The weather here has been great warm days and cooler nights light breezes with an occasional wind storm and dust. Over all it has been close to perfect. The hot weather is coming and the humidity, but for now I’m enjoying what I have as far as weather is concerned. I think this little house has gone beyond being a casita at this point and is a casa (house) and with the money I have spent on it I feel like I’m building a little palace. Actually a lot of the work could have been delayed and done piecemeal over the years. However my feeling is that it would cost me more as the price of labor and materials is growing and the cost of shipping is also going to go higher. So pay now or pay more later. I have a good builder now and his workers are doing a good job that should last a long time. The water heater is in, the air-conditioners are installed and the tile work in the bedroom, living area and porch is almost done, windows are installed, the stairs to the roof garden are installed, the dirt for the yard is delivered and being spread out by manual labor, the roof got another coat of sealant, the tile for the bath arrived, the stove is here, the cabinets for the kitchen are on order, the doors are ready to be installed, most of the lights are installed and working. Slowly things are being done and the end is a lot closer now. I was sitting up on my roof tonight watching the stars, it was a lovely warm night with a very light breeze some of my neighbors were enjoying the evening outside as well. It was very pleasant to sit and enjoy the evening and plan where I will plant some bushes and trees around the patio and house. I guess I am in full nest building role. I talked with some neighbors earlier and several are planning their trips north for the summer-I have no idea how long I will stay, as the summer nears the temperature and humidity will rise and it won’t be so comfy as it is now. Here are some photos of the dirt being delivered and dumped in the patio area. This is important as the base is mostly sand and this red dirt will add some nurishment to the garden and bring the level up so when it rains the rain water will be kept away from the house. How often is there a problem with that much rain water ? About once or twice a year we get a rogue thunder storm that dumps an inch or more of rain in an hour and the soil cannot absorb the water fast enough and it runs down the streets looking for a low place to flow into, so structures are elevated above the anticipated level of flowing rain water. The campers have been arriving daily and are zooming around on their four-wheelers and other toys having a good time and the nightly fireworks are a joy to the boys and girls. Holy week, or Santa Samana, is a big vacation time at the beaches and towns near them as thousands of families take a few days off and have fun at the beach. Monday it will be all over and the fun seekers will be headed back home to their usual routine and we will be left to enjoy the quiet and solitude of the beach community, that is those that are left. People have been heading north this past week, my neighbors who are Canadian left last wednesday and all the folks I knew at the RV park are gone they wanted to leave before the crowds of fun seekers arrived, they won’t be back till next fall. The builders are getting into the finnishing stages of building the Casa lots of painting done trim paint being put on, tile floor instal started, spiral stairs to the roof installed, steel cover on the grey water tank installed, fans installed, lights installed, windows installed. Still lots of work to be done; kitchen cabinets installed, bath finished and plumbing fixtures installed, A/C installed and roof sealed. Lots of minor things like switch covers and such. Also more dirt has to be brought in to level the lot. We are getting closer to the end of this project and soon (a few weeks) things will be done. Then I get to furnish the place.